A map of the moon composed of superimposed observations in visible and ultraviolet wavelengths has revealed an amazing treasure – hordes of titanium ore, up to 10 times richer than on Earth. This could be the necessary motivation to initiate a mining colony project in the future. The discovery was made possibly thanks to the US Lunar Reconnaissance Orbiter, which used its on-board powerful camera and swept the surface of the Moon, scrutinising it in seven different light wavelengths. LROC WAC mosaic showing boundary between Mare Serenitatis and Mare Tranquillitatis. Credit: NASA/GSFC/Arizona State University. Titanium is an extremely tough material, but it’s when combined into alloys with other materials like iron or aluminum that it truly shines. It’s applications range from military, to medical, to telecommunications to the ever important aerospace industry. Now, having the study’s results, which were presented Friday Oct. 7 at the joint meeting of the European Planetary Science Congress and the American Astronomical Society’s Division for Planetary Sciences in Nantes, France, the world has an economical impulse to jump start its lunar moon base projects. To reach this discovery, the researchers scanned the lunar surface and compared the brightness in the range of wavelengths from ultraviolet to visible light, picking out areas that are abundant in titanium. 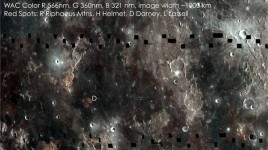 They then put together a mosaic using roughly 4,000 images that had been collected by the LRO’s instruments over one month, which they used together with the WAC ratio of the brightness in the ultraviolet to visible light to deduce titanium abundance, backed up by surface samples gathered by Apollo and Luna missions. “The new map is a valuable tool for lunar exploration planning. Astronauts will want to visit places with both high scientific value and a high potential for resources that can be used to support exploration activities. Areas with high titanium provide both – a pathway to understanding the interior of the Moon and potential mining resources,” said Robinson. So, it clearly has a double interest margin – on one side there’s the profit for the mining corporations brave enough to invest in such an operation, and on the other there’s the scientific community which has always striven to better understand our natural satellite’s interior. 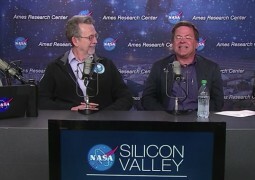 Jim Green, Director of the Planetary Science Division at NASA Headquarters, and SSERVI Deputy Director Greg Schmidt discuss NASA’s lunar plans.